Students: When using right triangle trigonometry and/or the Pythagorean Theorem to solve right triangles, you can use this resource to check results of your work afterwards. Directions: For any problem of this type, 1) Solve it completely first. 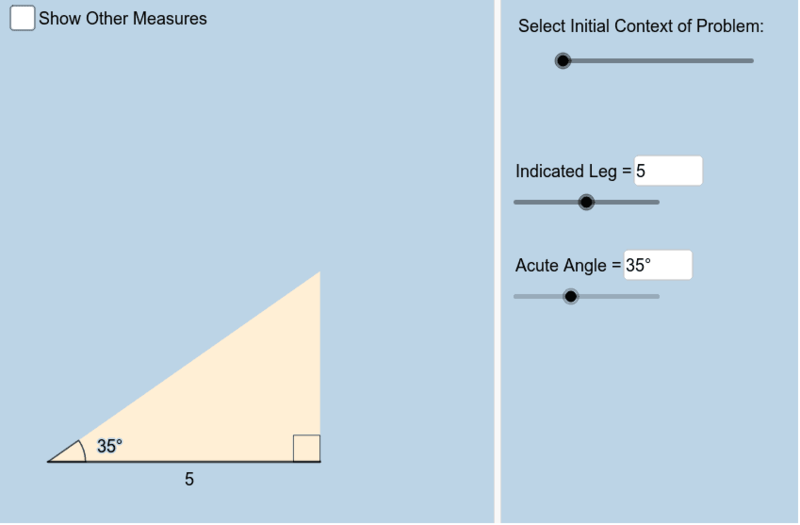 2) Then, use the slider (upper right) to select the appropriate right triangle context of the original problem. 3) Use the sliders and/or input boxes to enter appropriate values to recreate the triangle you solved. 4) Check the Show Other Measures box (upper left) to check results of your work. Note: For a side length, you can only enter values ranging from 0.01 to 10. To enter values > 10, simply scale down (ex: Enter 3.4 for a side length measuring 34 units long).